I’d like to introduce myself. My name is Lisa Hoefinger and I am thrilled to be working with Anna Nirva, founder of Sunbear Squad, on the new Sunbear Blog Squad. Over the last 16 months my husband, Horst, and I have been the bloggers on Dogster’s For The Love Of Dog blog. We’ve had a great time working on the FTLOD blog, and during our tenure realized we have a true passion when it comes to dog rescue. We have three rescue dogs- Bo, Copper, and Patience- and one rescue kitty, Mothball. After posting Sunbear Squad’s Tip Of The Week on the Dogster blog for the last year and a half we have gotten to know Anna very well. We realized that she shares our passion for stopping animal cruelty, helping rescues, getting laws changed to punish animal abusers, and teaching others how to be a good Samaritan for animals. It was this shared interest in helping animals that brought us together to start the Sunbear Blog Squad. Working with Anna we hope to reach even more people in the dog community, to hopefully give a voice to those who have none. We want to make the blog a place you’ll want to stop by on a daily basis and are looking forward to readers input. We’ll be swinging into full gear starting Monday, December 7th. Pictured above is our boy Bo, even he’s a writer. Bo just had his own memoir published, BAD TO THE BONE: Memoir Of A Rebel Doggie Blogger. It’s the first memoir written by a dog ever published in non-fiction. The book is dedicated to all the rescue and shelter workers who make this world a better place one animal at a time. They are our unsung heroes. Bo is donating a portion of the proceeds from the book to help homeless dogs. Saving rescues is a family affair at the Hoefinger household. Sunbear Blog Squad will be going live on Thursday, December 3. Please, look for us then. We look forward to your comments. 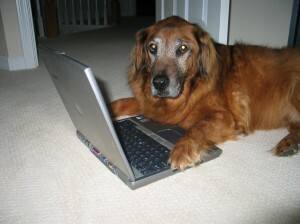 You are currently browsing the Sunbear Blog Squad blog archives for December, 2009.